MANUELA BADILLA RAJEVIC is a doctoral candidate in Sociology at the New School for Social Research. Her work, at the intersection of cultural and political sociology, addresses topics related to cultural memory, social movements, power, and political violence. 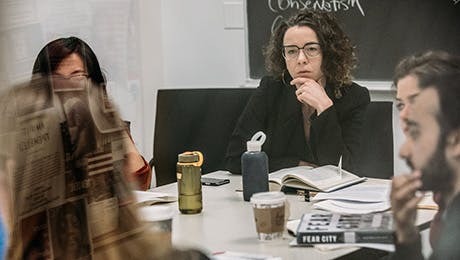 Her dissertation project, Ephemeral Mnemonic Assemblages in Post-dictatorship Chile: A Radical Turn in the Design of Public Memory, explores the connections between social mobilization, new generations, and the design of public memory in post-dictatorship Chile. This project combines ethnographic observation, in-depth interviews, and archival work to investigate the strategies by which the Chilean post-dictatorship generation is composing images, trajectories, and objects to remember the 1973-1989 military regime. These mnemonic assemblages offer the opportunity to explore the effects of objects that are not made to last in the construction of a public cultural memory, and that challenge public memories by considering other legacies of the dictatorial past that have not been included before, such as striking social inequality. Such public expressions of memory mobilize social actions and may disrupt the current democratic order. Manuela holds a Master's degree in Sociology from The New School (2013) and has held research positions at the University of Chile, Flacso (Latin-American School of Social Sciences), and COES (Centre for Social Conflict and Cohesion Studies, Chile).